Real-time fitness tracking, at your fingertips, no extra devices required. Our apps use your smartphone's GPS to record every detail of your workout. Follow your route on an interactive map while logging time, distance, speed, pace, elevation and calories burned. Set your goal and hit it. Farther, faster, longer, or just plain more often. You decide where you want to go and we'll help you get there. Make every workout count. MVP users gain access to a wide selection of training plans, like couch-to-5k, marathons, century rides and more. We're open. 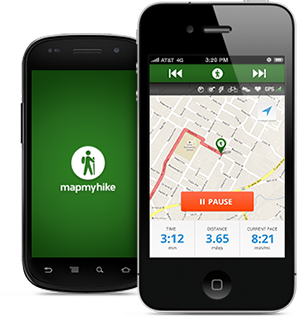 If you have a popular fitness tracking device, chances are you can import the data into MapMyHike. How healthy is your weight? Calculate your Body Mass Index to find out.